FRANKFORT, Ky. – Agriculture Commissioner Ryan Quarles joined other state officials and science experts on Monday to announce a partnership of the Kentucky Department of Agriculture and the Kentucky Department for Public Health to prevent the spread of Zika virus in Kentucky. The campaign, called “Fight the Bite Day and Night,” aims to provide information to the public about the Zika virus and ways to avoid being bitten by the mosquitoes that carry it. 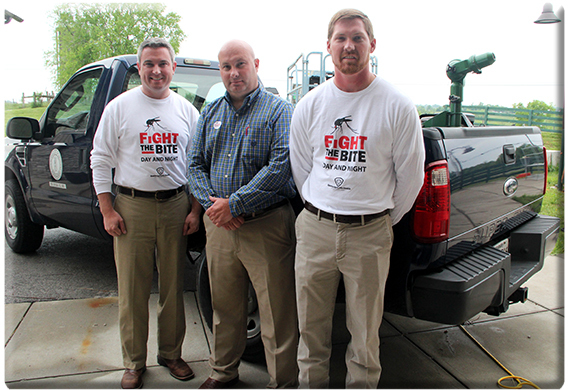 Commissioner Quarles said the KDA’s Division of Environmental Services sprays for mosquitoes at the request of local officials and local health departments. Eight KDA employees spend an average of 3,100 hours treating some 100,000 acres each year, he said. The department also maintains a contract for aerial applications to address unusually high mosquito infestations such as an outbreak in western Kentucky in 2013. The division operates ultra-low-volume (ULV) fogging machines for mosquito control in parks, summer camps, and other outdoor areas where people congregate. The product the department uses is made to work effectively and biodegrade quickly. The KDA and the Department for Public Health have entered into a Memorandum of Understanding that would allow DPH to utilize the agriculture department’s ULV equipment to target areas with known cases of Zika virus. To find out more about the KDA’s mosquito spraying program, including a mosquito spraying schedule, go to the department's Public Pest and Recycling Assistance page. The U.S. Centers for Disease Control and Prevention says the Zika virus is spread to people primarily through the bite of an infected Aedes species mosquito. The most common symptoms of Zika are fever, rash, joint pain, and conjunctivitis (red eyes). The illness is usually mild with symptoms lasting for several days to a week after being bitten by an infected mosquito. Zika has been linked to a serious birth defect called microcephaly as well as other severe fetal brain defects. The CDC is investigating a potential link between Zika and Guillain-Barré syndrome (GBS), a sickness of the nervous system in which a person’s own immune system damages the nerve cells, causing muscle weakness and, sometimes, paralysis. The state public health department has reported that six Kentucky residents have contracted the Zika virus while traveling to affected areas overseas. For more information about Zika virus, go to the Department for Public Health's Zika virus website. For up-to-date information about Zika virus in Kentucky and the mosquitoes that spread it, go to the University of Kentucky's Zika virus website.